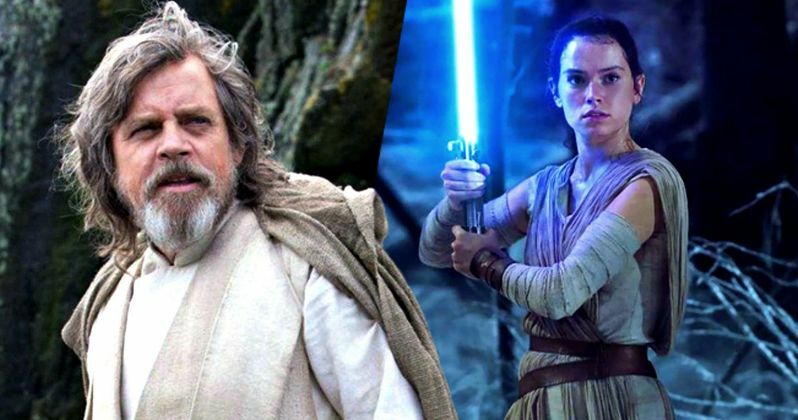 While most fans will likely have to wait until Star Wars Celebration to see the first Star Wars 8 trailer, a group of lucky investors got to see the first snippets of footage much earlier. Disney held their annual shareholder's meeting today, which was attended by several members of the press, who got to see the first ever footage from Star Wars: The Last Jedi, including the opening scene. If you want to go into Star Wars 8 completely SPOILER-FREE, then read on at your own risk. Otherwise, read on for details about the opening scene. After not uttering any lines in Star Wars: The Force Awakens, this new footage showed Luke Skywalker asking, "Who are you?" to Rey, before she's seen "deftly" handling a lightsaber. The footage also featured beloved characters such as Chewbacca (Joonas Suotamo), General Leia Organa (Carrie Fisher) and Finn (John Boyega), along with footage of numerous settings including mountains, oceans, forests, deserts, which were described as "suitably epic" and "exotic" by L.A Times reporter Daniel Martin. There was also a shot of an "X-wing wobbling mid-air, under attack inside a giant ship," with Daniel Martin adding that the ship, "Looked like a wounded bird." During the shareholder's meeting, Disney CEO Bob Iger also addressed the heartbreaking loss of Star Wars icon Carrie Fisher. Here's what he had to say below. "Carrie Fisher has been an iconic part in this franchise from the very beginning. We all miss her. She has great talent and wit. We're proud that this movie coming up is part of her legacy." Bob Iger did not address reports that surfaced last month, which claimed that Star Wars 8 reshoots took place to pay tribute to Carrie Fisher and her iconic character. There were reports that Carrie Fisher has two key scenes in the next two Star Wars movies, though it isn't known where these scenes were supposed to fall, or what was already shot. The first major moment has force sensitive twins Luke and Leia reuniting. The second scene has Leia confronting her son Ben, who has transformed into Kylo Ren. While we know part of the Luke and Leia reunion was shot, there is no indication that Kylo Ren actor Adam Driver and Carrie Fisher were ever on set together. With the trailer for Star Wars: The Last Jedi supposedly arriving next month at Star Wars Celebration, it isn't known if Disney LucasFilm will release any plot details to go along with the trailer. The studio didn't release an official synopsis before Star Wars: The Force Awakens hit theaters in 2015, and it wouldn't be surprising if they followed the same strategy with Star Wars 8. Take a look at the tweets from Los Angeles Times reporter Daniel Martin which reveals details about the opening scene in Star Wars: The Last Jedi.